We are so excited to announce our 2012 Homemade Nursery Rhyme Costume Contest Winners. We had some delightful costume ideas to choose from this year. From birds, old ladies to a trio of Rock, Paper, Scissors, it was a lot of fun deciding who our very first costume contest winners would be. 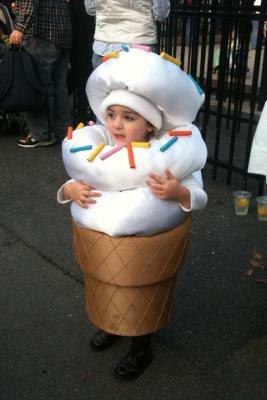 Our first prize of $250 cash prize goes to Courtney Henry for her adorable Ice Cream A Penny A Lump. Her daughter Zoey makes a delightful ice cream cone! Our second place winner of $175 goes to Darcy Reaver with her precious Little Bird. Darcy even went to far as to create a nest for her precious little Elena! 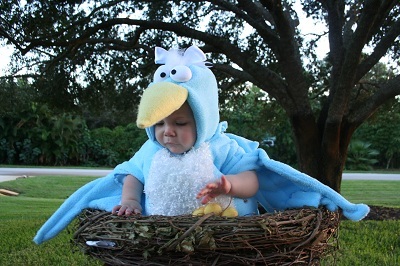 "Thank you so much for selecting our "Little Bird" costume as a winner in your Nursery Rhyme Costume Contest. I love your web site for nurturing the love of reading to children. I recently bought a large nursery rhyme book and I am inspired to make more themed costumes throughout the year. Thank you for the inspiration!" Darcy, we thank you for such a delightful costume idea! So happy that you have been inspired by our website! And our third place winner of $75 goes to Marie Batchelor and her pretty in pink Mary Had A Little Lamb. 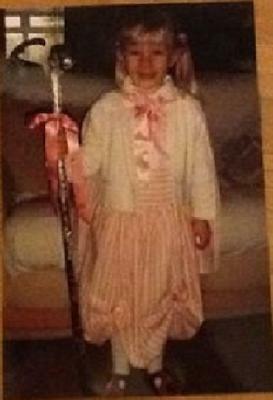 Her daughter is so pretty in pink satin with her silvery shepherdess staff! Our congratulations to all our winners! For those of you who have created your own nursery rhyme themed costumes, you can start now to submit for our 2014 costume contest.